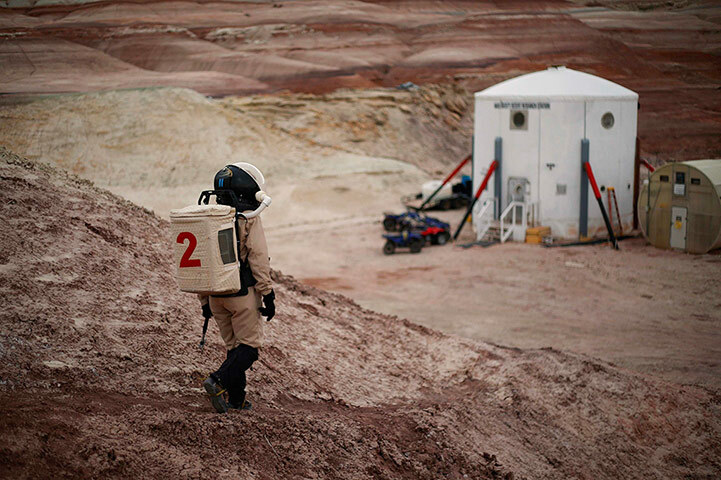 Photojournalist Jim Urquhart has this great set of photos from the Mars Desert Research Station, which conducts dry runs for future Mars missions in the Utah desert. "Mars is the great challenge of our time. In order to help develop key knowledge needed to prepare for human Mars exploration, and to inspire the public by making sensuous the vision of human exploration of Mars, the Mars Society has initiated the Mars Analog Research Station (MARS) project. A global program of Mars exploration operations research, the MARS project will include four Mars base-like habitats located in deserts in the Canadian Arctic, the American southwest, the Australian outback, and Iceland. In these Mars-like environments, we will launch a program of extensive long-duration geology and biology field exploration operations conducted in the same style and under many of the same constraints as they would on the Red Planet. By doing so, we will start the process of learning how to explore on Mars."